Large heat resistant handle for safe operation of the top platen. Heavy gauge water resistant and flexible plastic conduit protects electrical connections. Embedded elements in cast iron platens provide superior heat distribution and fast recovery. Star’s line of Grill Express Two-Sided Grills provide commercial performance at an affordable price. Thermostat is rated from 175°F (79°C) to 450°F (232°C) and provides accurate sensing of temperature. Spacious grilling height accommodates products up to three inches, as well as thin products like tortillas and quesadillas. The bottom platen has a patented 3/4” splash guard corralls product and offers maximum protection against grease spills. Heavy-duty cast iron platens, available in grooved or smooth, provide longevity and superior performance to meet your menu requirements. A reliable hinge system provides effortless operation and is designed for even pressure on both sides of product for consistent heat and searing of product. Star’s Grill Express is designed for restaurants, snack bars, taverns, kiosk, convenience stores and other commercial operations with limited space. 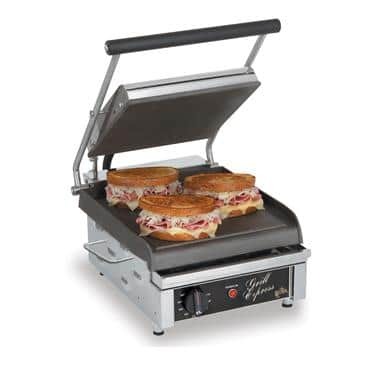 The Grill Express line is perfect for grilling tortillas, sandwiches, burritos, wraps, steaks, chicken, fish or any product you want grilled fast and easy. Star’s Grill Express is constructed of 20 gauge stainless steel with grooved or smooth cast iron platens with embedded metal tubular elements. Reliable hinge design with extra large handle, adjustable legs and stainless steel grease tray. A water resistant 6’ lead-in cord is furnished with a standard NEMA plug. Grill Express is covered by a one year parts and labor warranty. Grills are constructed with 20 gauge stainless steel body and cast iron grooved or smooth platens. A spring hinge mechanism provides easy operation of top platen. Grilling up to 3" between platens with hinge system provides pressure to cook both sides of product. Embedded metal sheathed tubular elements are provided. Non-skid feet adjust up to one inch. Units are provided with pilot light, six foot power cord with NEMA rated plug (see specifications above). Unit carries approval of UL, UL Sanitation to NSF Standard 4 and UL Canada Standards. Printed in the U.S.A.